I believe that locating, cultivating and maintaining access to green space in every Philadelphia neighborhood is vital to the success and growth of the city. As mayor, I will provide City support to community and neighborhood groups to develop and enhance green spaces throughout the City. I also believe that Philadelphia must make investments in making our City buildings increasingly energy-efficient. In 2014, along with my City Council colleagues, I pushed for the Department of Public Property to study all police stations and firehouses to determine necessary repairs and enhancements to make the buildings safer and cheaper to operate. As mayor, I will continue this effort. I will also explore the expansion of zoning and development incentives for Green buildings and the installation of real--time energy monitoring in City- facilities. Would you maintain or expand funding the Mayor’s Office of Sustainability? Philadelphia’s public infrastructure to protect our environment and save money for future generations. 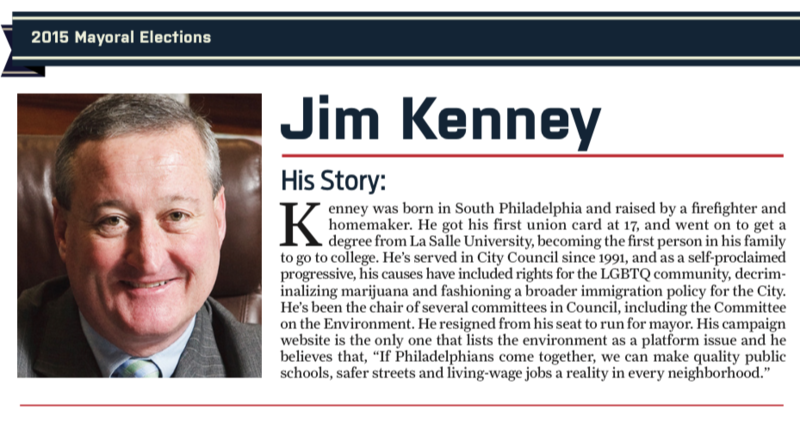 As mayor, I will adopt a “Vision Zero” (see Grid’s "The Progress That's at Stake" page in this section) goal for the City of Philadelphia. I will take a multi-faceted approach to implementing “Vision Zero.” This includes continuing and expanding on the work of the Nutter administration by increasing the number and safeness of bike lanes throughout our city. I will form a Vision Zero Task Force made up of stakeholders from local and state transportation agencies, public safety agencies, advocacy groups, local businesses and community members. This taskforce will create a Vision Zero Action Plan for Philadelphia so that we can ensure that no more lives are lost needlessly to preventable traffic accidents. A great deal of litter results from improperly set--out trash. Reducing litter requires a comprehensive approach that increases both education and enforcement. As mayor, I will increase coordination between trash collectors and the litter enforcement agents (e.g., trash day ride-alongs) and expand programs like circular--free stickers. SWEEP (see Grid’s "The Progress That's at Stake" page in this section) is a great program, but it needs expansion so that our officer patrols are better coordinated with the hours when curbside trash is set out. I would also explore a plastic bag fee to directly fund the expansion of enforcement efforts and other anti--litter programming.